More economical pack size - save 35%! Royco, with quality meat & spices authentic Indonesian that delivers the delicious meaty & umami flavour. Salt, sugar, enhancer (monosodium glutamate, disodium inosinate and guanylate), dextrine, natural identical chicken flavour (contains egg), onion and garlic powder (1%), vegetable oil, corn starch, anti caking silicon dioxide, white pepper powder, acid regulator citric acid, celery powder, chicken meat (0.02%)(contains antioxidant TBHQ), turmeric powder, colorant tartrazin CI 19140. Authentic Indonesian seasoning, made from selected chicken meat & blends of natural Indonesian spices to deliver rich meaty & umami flavour to your dishes quickly! 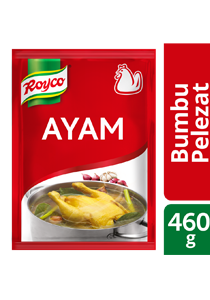 Easily absorbed to many types of ingredients, suitable for various Indonesian dishes, e.g. soupy, stir-fry, etc. 1. Boil whole chicken until cooked . Then take out the chicken meat from the boiled water (broth). Store in cool and dry place. Use clean & dry spoon and closed tightly after open.